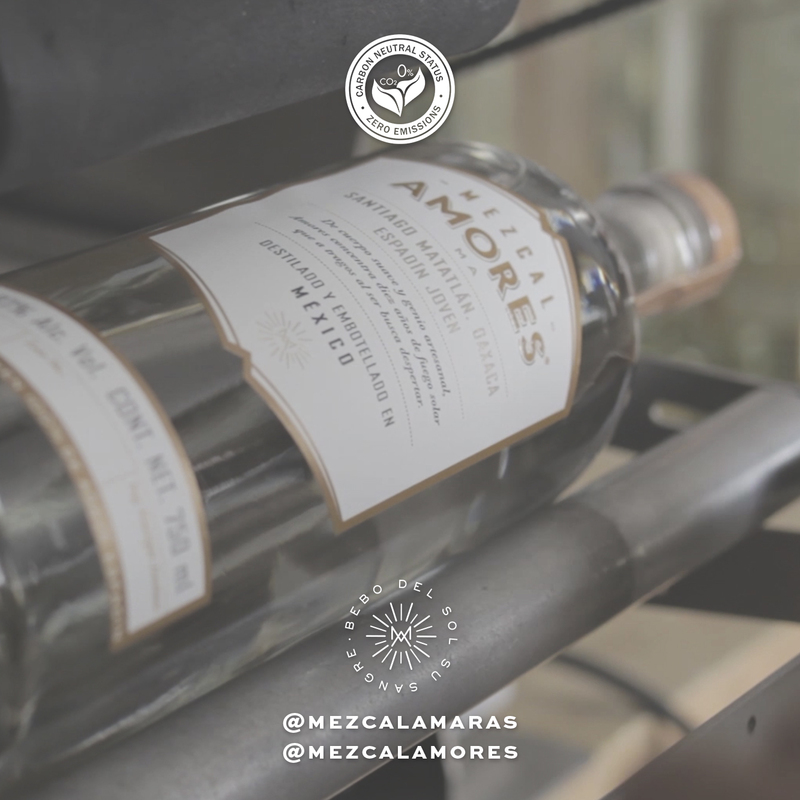 Mezcal Amores now has Neutral Carbon Status, maintaining the organic and natural spirit of our drinks. Thus we reiterate our commitment to the land. Mezcal Amores has voluntarily incorporated the Neutral Carbon Initiative since 2017, which refers to the integral management of its greenhouse gas emissions, which gives us the Neutral Carbon Status. 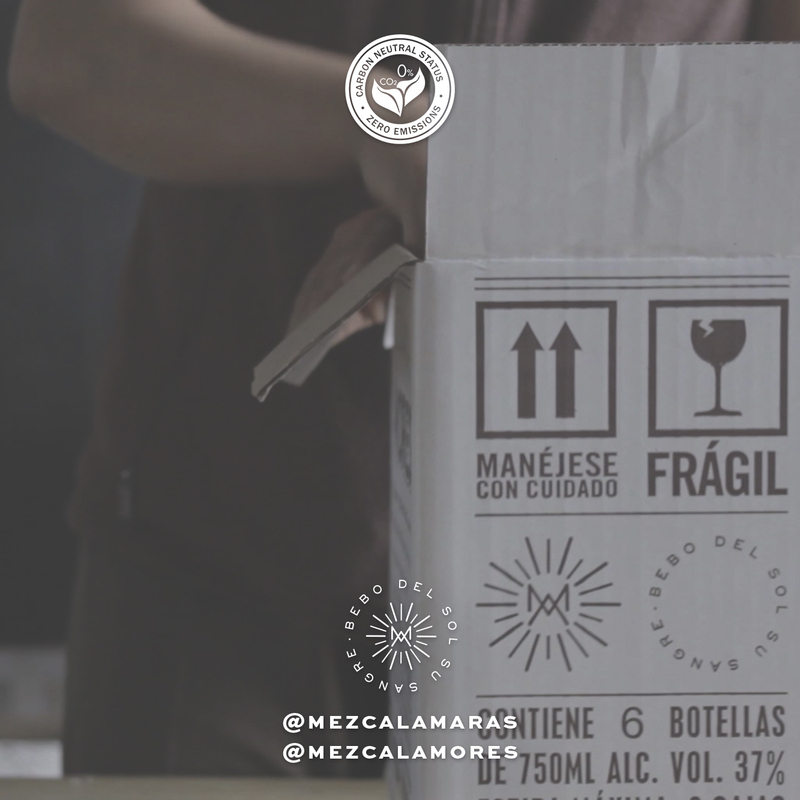 Neutral Carbon Status means that the greenhouse gas emissions of all of the Mezcal Amores’ products have been quantified, reduced and compensated. The initiative includes from the use of electricity, fossil fuels in fixed and mobile sources belonging to the company, to all those indirect emission sources resulting from uncontrolled processes such as the manufacture and transportation of raw materials – including glass bottles, cardboard and plastics -, the distribution of products, the transport of personnel, the handling of waste and the final disposal of packaging material. Being of vital relevance the reliability of the calculation procedure of the emissions, Mezcal Amores has obtained the License for the official use of the Bilan Carbone® methodology, a methodological tool created by the Ministry of Environment and Energy Control in France (ADEME) and currently managed by the Bilan Carbone Association, also in France. The Bilan Carbone® is based on the general criteria of the GHG Protocol and ISO14064, the main international standards for the reporting of emissions in the industry and services sector. The reduction of emissions has taken place thanks to a re-use and integral management of process waste and packaging material (plastics, cardboard and glass rejection, ..). We have also reduced indirect emissions from the manufacture and transport of agrochemicals through the preparation of a fertilizer of organic origin from process waste and organic additives from other crops. These and other reduction measures will continue to be implemented as part of a reduction objective in the short and medium term. Regarding the compensation of emissions, we have compensated the complete emissions of the activity and the life cycle of products (Scope 1-3 of the GHG Protocol). This has been possible through the acquisition of 1000 certificates from a forest preservation project in the Amazon, monitored and strictly verified under the Verified Carbon Standard (VCS). Located in the state of Para, in northwest Brazil, the project was implemented since 2008 and aims to preserve about 177,900 hectares of native Amazonian forest. The compensation process is public and transparent through the APX VCS certificate registration platform. Thanks to this initiative, Mezcal Amores has become the First Carbon Neutral Mezcal in Mexico and the world with the Bilan Carbone® License, with an emission quantification procedure based on the GHG Protocol standard and with a transparent emissions compensation program. public that includes the total emissions of the activity and the integral life cycle of each of our products. A few months ago, Mezcal Amores/Amarás, received a very important certification on the international market, the Kosher Pareve seal. 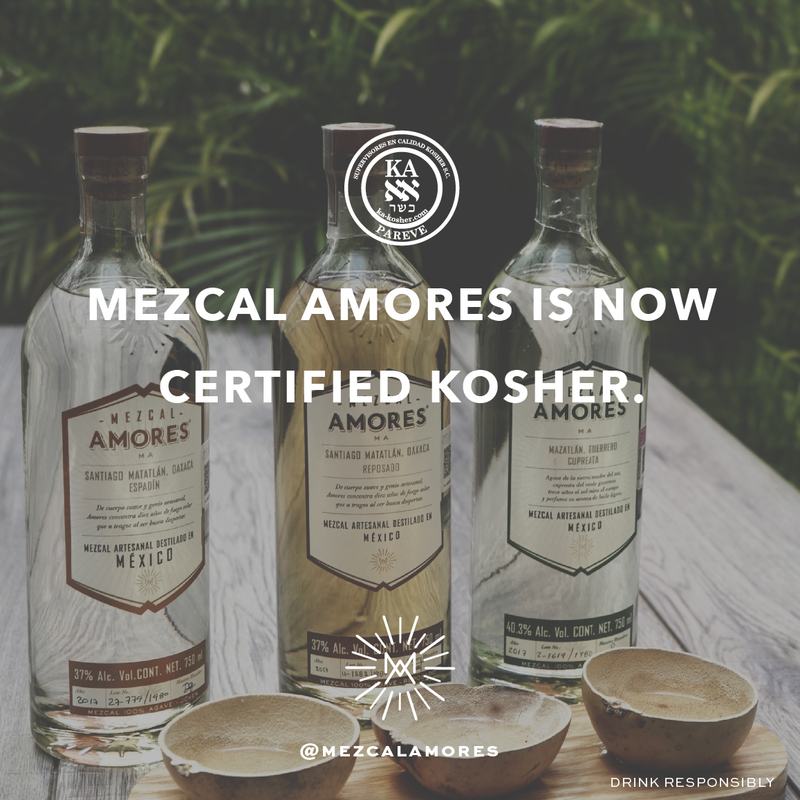 Mezcal Amores/Amarás received this certification from Kosher Alef. * Food and/or beverages may lose their Pareve status if they’re processed with equipment that was and/or is used for meat and/or dairy products. * Likewise, this is lost if additives derived from meat and/or dairy are used at some point of the production process. * Finally, in the process and/or content, fruits, vegetables and grains should be checked for the presence of insects or larvae, which are considered not kosher. Mezcal Amores/Amarás, the mezcal that honors Mexico and its producing communities, is now available in Canada, Dominican Republic, Japan, Greece and Israel. For Mezcal Amores/Amarás founders, it’s been always essential to position mezcal as the authentic Mexican beverage and so to share it with everyone around the world, not only to drink, but also as a sustainable and conscious project that could be use to share the passion and devotion Mexico’s roots and so to take our traditions all over the world. In Mezcal Amores, we use agaves that absorb solar energy from 6 to 30 years until they reach its maturity point, then when energy is at its peak, we capture it and share it in and out the country. In each and everyone of the countries we enter, we work within strategic importers; partners who actually, have more than passion for spirits, but also a deep love for mezcal. Meet some of our new partners: Mangosteen in Japan, Consorcio Solano SRL in Dominican Republic, Tsaknakis Bros in Greece, Tank in Canada and Miki Not in Israel. Each one of these new partners, understands and backs the Amores Philosophy, which ensures the preservation of the land where our agaves grow for all the future generations, besides keeping a true promise of commitment with the local communities through our Maestros Mezcaleros, farmers, and all the people working and striving in the states where our agaves grow. For the land, mezcal, for the world, mezcal as well.